For whatever reasons — capital outflows, PBoC non-intervention — the yuan has depreciated substantially since the Trump administration has announced Section 301 actions against China. This has implications not just for the CNY/USD exchange rate, but also other East Asian currencies. It’s interesting to note how the overall US trade weighted dollar against a broad basket of currencies comoves with the CNY/USD exchange rate. Figure 1: Nominal trade weighted US dollar (blue, left log scale), up is dollar appreciation; and CNY/USD exchange rate (red, right log scale), up is dollar appreciation against CNY. Source: FRED. Over the sample period, the correlation between the two series is positive and statistically significant. Each one percentage point depreciation of the yuan against the dollar was associated with a 0.88 percentage point appreciation of the broad trade weighted dollar. The adjusted R2 is 0.36. The key message of our analysis is that it is premature to declare a stable renminbi zone, defined as a set of jurisdictions with currencies that share more than half of the renminbi’s movements against the dollar (ie for which β1 exceeds 0.5). Such a zone has the force of trade links, business cycle correlations and possibly increased financial links behind it, but it evidently depends on a multilateral and predictable management of the renminbi’s exchange rate. In the period since May 2017, our estimates of β1 suggest a strictly northeast Asian renminbi zone. Their conclusion means it’s an open question what will happen to other East Asian currencies as the CNY depreciates. If the Chinese authorities have given up on basket management, then the comovement of other currencies with the CNY may be minimal (although how the other central banks of the region will react also matter). If the East Asian central banks want to stabilize against the CNY, then the US trade weighted currency might appreciate more than implied by the 21.6% weight accorded the CNY. This in turn would mean more headwinds for Mr. Trump’s goal of a reduced US trade deficit. Only a floating currency can depreciate. I thought the Yuan was a currency where the rate was determined by the Government thus it would be a devaluation. Not Trampis: Language is flexible (no pun intended!) when it’s a highly managed float. so it was a devaluation. good. We must get you Yanks to understand the english language correctly!! He’s talking about a “managed float”, (there’s some gray area in there), so I don’t think he really got that wrong. Thought you were an economics guy?? I would also mention which brand of English most non-English speaking students most desire to attain learning in recent decades…… but that would be petty, yes?? The Yuan/Reminbi has been transitioning to a “float” currency for the last decade. https://www.bloomberg.com/news/articles/2017-11-16/yuan-looks-more-like-floating-currency-nowadays-fed-study-shows. a managed float is not a float as a floating currency cannot be managed. We’ve all known for awhile Aussie males have a real difficult time with nuance—but come on—let your originally British (Hougoumont) part shine through on this one, would you?? Thanks for the superb analysis and the pointing in the direction of and link to the Shu/McCauley paper. I get tons of these papers on my computer, and your recommendeds go near to the top of the pile somewhere. I imagine a lot of currency traders are mulling this stuff over. If we can disassociate ourselves personally and mentally from the human suffering involved, all the machinations should kind of be “entertaining” in a demented way, yeah?? Doesn’t sound like a nice thing to say but…..can’t help but to have thought it. Menzie I’m wondering how the devaluation of the Yuan affects “the common man” on the streets of China? ?—>>or as Pettis calls them “Ordinary Households”?? Can we assume that the devaluation of the Yuan transfers income away from “ordinary households” (I like to call them “the common man”) in China to “rich households” and large businesses in China?? Moses Herzog: A devaluation will hurt those who are high consumers of imported goods, which I would assume are middle to high income households. High income households will benefit if they have foreign holdings of assets denominated in dollars. Of course, stricter capital controls that might be emplaced will make it difficult to access those savings. Middle income households who have members employed by exporting industries might benefit, although devalued currency will raise imported input prices, so the benefit might be attenuated. In terms of the rural households, to the extent that they compete with the US in agricultural output (where the US has comparative advantage), they would benefit from higher prices (also coming from tariffs). On the other hand, to the extent that a large proportion of their income is devoted to food, they will lose out. So where this all lands a given household, you can see, is hard to say. The nation as a whole will have its net foreign assets rise in valuation, especially given the three trillion odd dollars worth of Treasurys, Bunds, Gilts, etc. held by the PBoC/SAFE and the Chinese SWF. Let me preface this by saying I am an extreme NONbeliever in Bitcoin. But I had read that some Chinese are using Bitcoin as a way to get around the capital controls. I’m curious if that will gain more traction over time. As you well know, Chinese are rather ingenious at “work arounds” and being resourceful when needs be. I imagine there will be some interesting Bloomberg articles popping up on mainland Chinese finding ways around those capital controls over the next couple years—one example of the “entertaining” machinations I referred to above amongst this trumpian mess. The ones (individual citizens) in that camp probably don’t need to access it that quickly and maybe weren’t thinking of “liquidity” when they parked the foreign denominated stuff?? Fascinating topic to me. Moses Herzog: I’d say that part of the collapse in Bitcoin was the regulators clamping down on Bitcoin exchanges in China. And the reason Bitcoin was so popular was I suspect to evade capital controls. Unfortunately, I don’t have any more insight (or proof) than what is provided in the several Bloomberg articles. moses, i would also suspect the devaluation will have an indirect impact here in the states. there are a hundred thousand chinese graduate students in the us, and thousands more undergraduates. devaluation will certainly have an impact on those that pay tuition and living expenses while in the states. this will reduce the number of students coming here for an education. further, many are very high quality students, who stay upon graduation and contribute directly to the us economy. that potential will also be reduced. as for bitcoin, not sure the magnitude of its use in transferring funds. my experience has been many folks looking to export their money are not completely tech savvy (as in bitcoin), but perhaps their children are? those with funds tend to be older. it seems to me, there is still quite a bit of money simply flown out of the country unreported during trips. and the less tech savvy seem to be very savvy in using overseas purchases of home, art, whatever as a means to move capital out of beijing. while the focus is always on the millionaires, it seems there are plenty of middle income folks who move only tens or hundreds of thousands out of the country, a much easier prospect to do under the radar. while bitcoin seems a good idea at first, its volatility makes it a risky proposition. the yuan may fall 5% over a given period, but bitcoin may fall 50% over the same period. people move money for safety reasons, i would imagine. I wonder if Trump is reading this blog. If so, he probably asked Kudlow what this latest one meant. Larry: He said the Chinese currency is weaker and the dollar is stronger. Donald: That is a good thing – right? There’s only one problem with this imagined dialogue: That Orange Excrement cares not one iota about exterior opinions to his own. Well, really two problems. It also assumes Orange Excrement possesses any intellectual curiosity at all. One way to “ring fence” China is the international community banning foreign firms from operating in China. Production can shift to other Asian countries, which have become cheaper, since China is moving up the value chain from coerced and stolen foreign technology. China will have to import goods produced in other countries and whatever tariffs China sets will be matched. Another off the point rant. Listen PeakRacist – we get you hate all things Chinese. The “ring fence” strategy might have been something President Obama and/or Susan Rice would have tried. Why?? Because both of them are intelligent and might try to read 2-3 major papers every morning. trump is only ever able to watch FOX news and repeats of Pee-Wee’s Playhouse, so he tries the “Let’s piss off all our allies” strategy, which really isn’t very effective. International tax slimeballs (I meant lawyers) know what this is about. Divert profits from intangibles to tax havens so as to evade paying taxes in the U.S.
Maybe PeakDishonesty does know all of this is he is advocating blatant tax evasion! 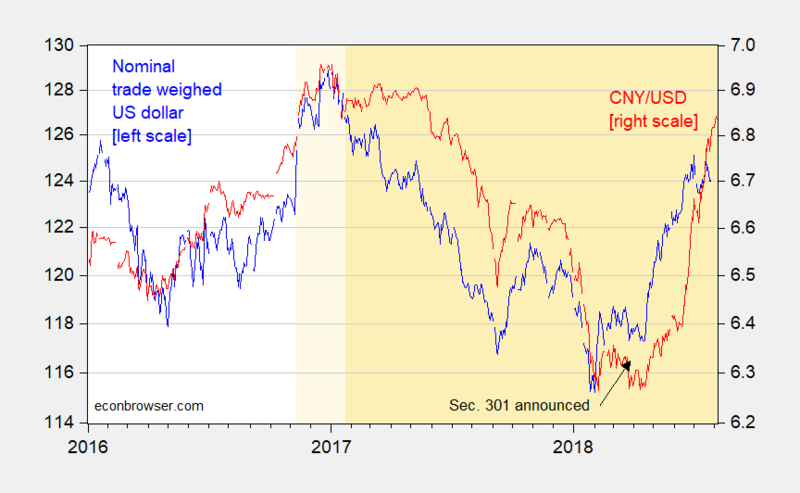 The last time I was in China speaking with people connected to Chinese monetary and forex policy, the word was they were doing a managed float, somewhat imitating what Singapore has done for some time, basing it on a basket of currencies correlating with trade weights, but not exactly. Anyway, Menzie’s post is consistent with that. China has lots of trade with those Asian currencies that are moving with it, so it is really more of a US appreciation against a bunch of currencies that move together, although the yuan/rmb cluster has moved down some against Japnese yen and euro. When I was there I found Chinese people’s attitude to Singapore rather curious. When giving examples of how great Chinese people were (something they rarely had a shortage of examples of, even if horridly bad examples, or examples that contained some gargantuan stretch of logic) they would often bring up Singapore, as the leader was ethnic Chinese. I kept wondering if they thought Singapore’s example was so great why they couldn’t attempt to follow that example more (and yes I know Singapore is quite particular in some aspects, but let’s get real here, it’s not just that). The idea that Singapore was much more efficient than China because China had many crappy leaders and that copying Singapore’s policies could be very beneficial was completely lost on them. The ONLY part that registered for 98% of mainland Chinese was “The leader of Singapore is ethnic Chinese!!!”. I suspect “CCTV” had brainwashed Chinese on Singapore, for no other reason than at that time, the leader had held power for 3 straight decades, an idea the Chinese Politburo strongly craved reinforcing to their citizenry. So what is being demonstrated with this post is not only is the trade weighted dollar within the same range it has been in Menzie very short time span, but is within the same range it has been since the trade weighted dollar was designed and published.